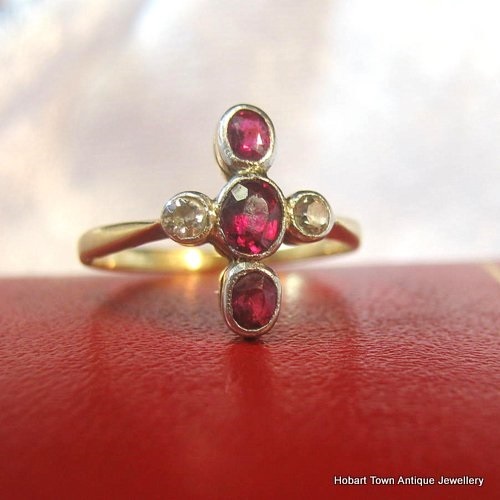 This Victorian Ruby Diamond 18ct Gold Cruciform Antique Ring is a beautiful and authentic 19thC Ruby & Diamond ring with the design that “suits any hand perfectly”. 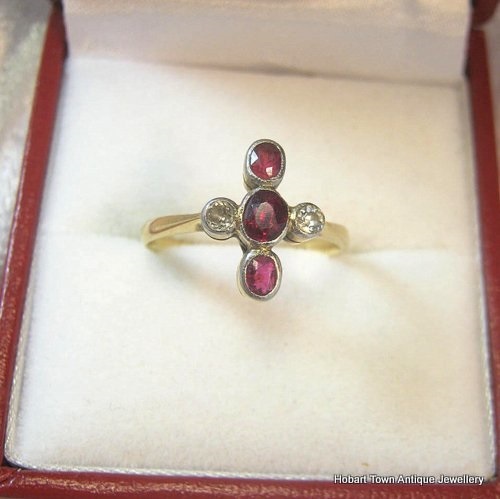 What a gorgeous , character filled Victorian Ruby Diamond 18ct Gold Cruciform Antique Ring this one is. 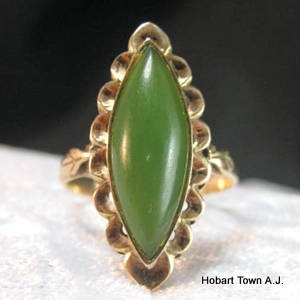 Of the 1,000’s and 1000’s of various antique rings designs , styles and variations ~ it s quite often the less decorated , less flashy , more hand made looking rings that have the most character , charm & beauty even. 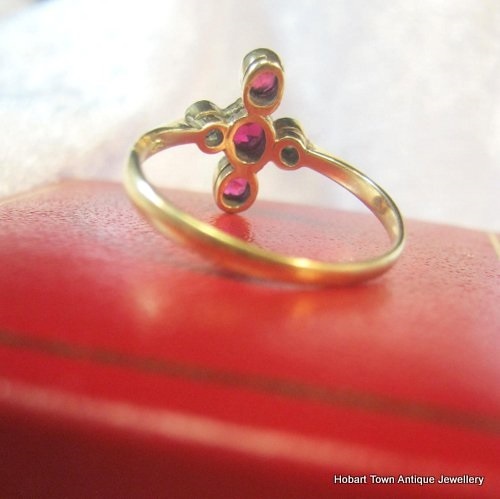 This Gorgeous Antique Ruby Diamond Gold Cruciform Victorian Ring is one such ring! 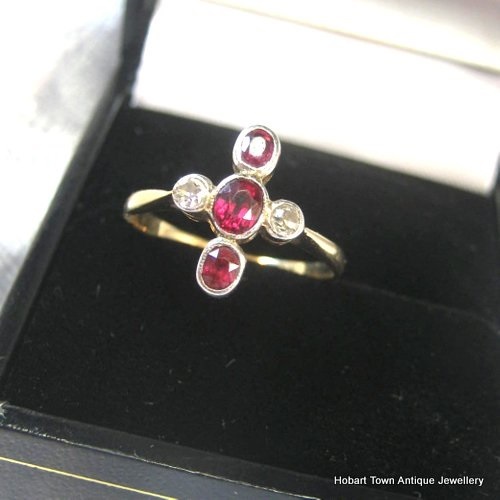 Such beautifully coloured natural Ruby’s ~ plus the Hand Made charm and character ….. combined with the rose cut diamonds in such a “perfect design” for a woman’s hand ~ this Victorian Ruby Diamond 18ct Gold Cruciform Antique Ring is one seriously fine ring! 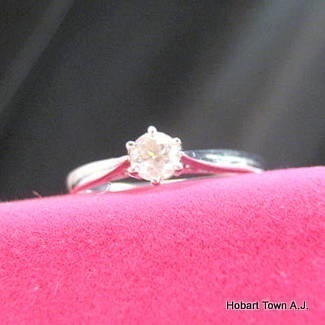 As you can see from the image showing the ring on hand , it is a well proportioned good size ring ~ without being overly large or ostentatious at approx; 12 mms x 9 mms. 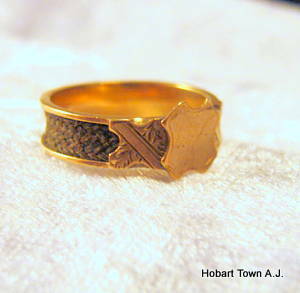 Being a relatively low set ring , it an be worn fairly much anywhere at anytime. Yet in saying that , I never recommend that any quality jewellery be worn while submerging hands in dish washing , surfing or swimming pools etc. 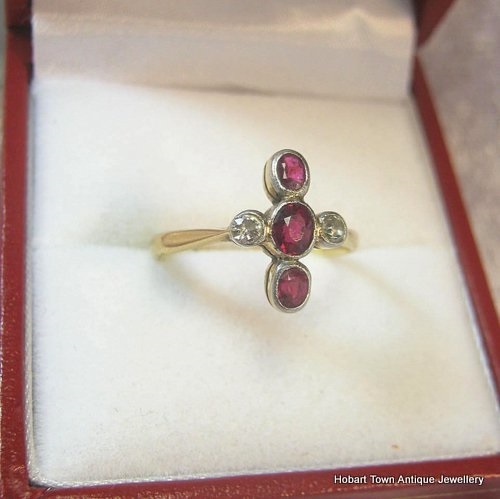 The central Ruby is an *estimated at .25ct’s ~ with a total of .55ct’s of natural diamonds and Rubies to this very appealing 19thC antique ring! 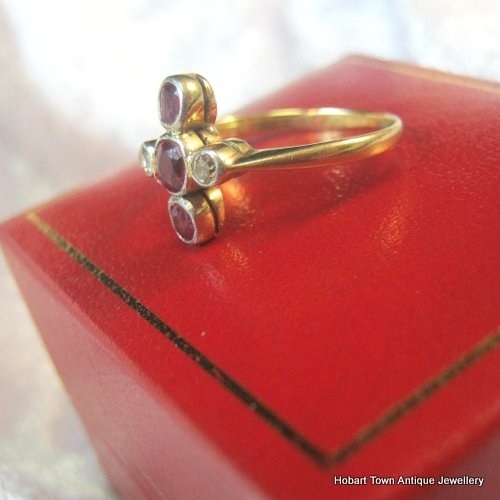 The hand made charm and character of the ring is obvious and is something that attracts hundreds of millions of people over the globe to antique jewellery & antiques in general ……. something that modern jewellery simply cannot provide , no matter how hard contemporary jewellers try! 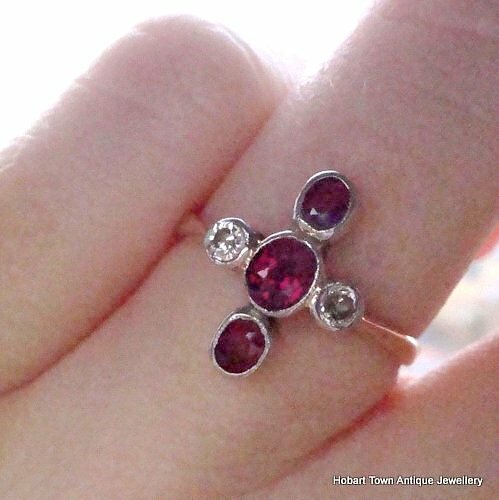 With ‘rub over’ set diamonds and ruby’s , in st.silver mounts , as per ‘the norm of the day’ , every single aspect of this character filled antique ring being exactly ‘as it should be’ ~ there are no negatives or issues with this stunner! 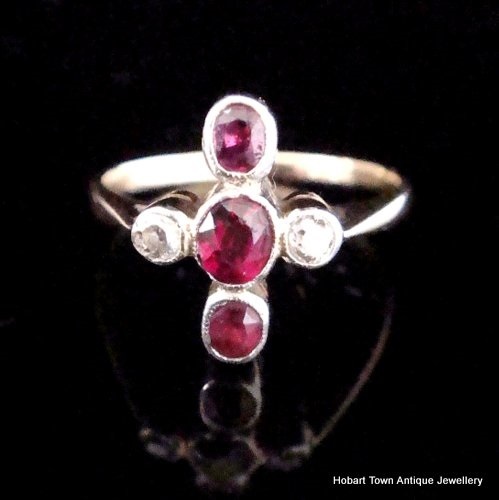 The faceted & Beautifully coloured natural rubies , with a rose cut diamond either side and the undeniable charm and character that a quality 130/140 year old Hand Made ring can’t help but radiate! 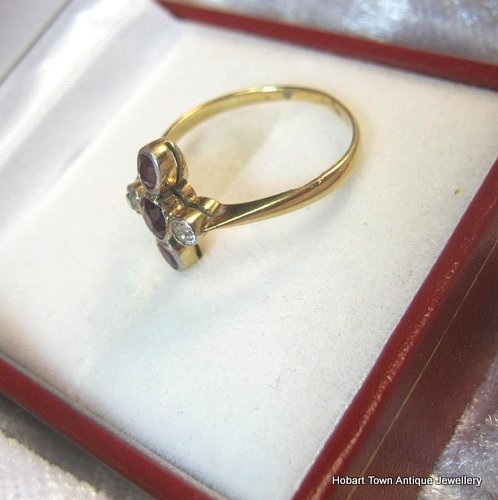 With the use of 18ct gold & the above , all combine to make this handsome antique ring both a fine quality ring yet also a beautifully attractive ring that radiates charm , character and an obvious “antiqueness” to the viewer of this special ruby & diamond ring!! The basic design of this ring suits / matches the human finger perfectly! 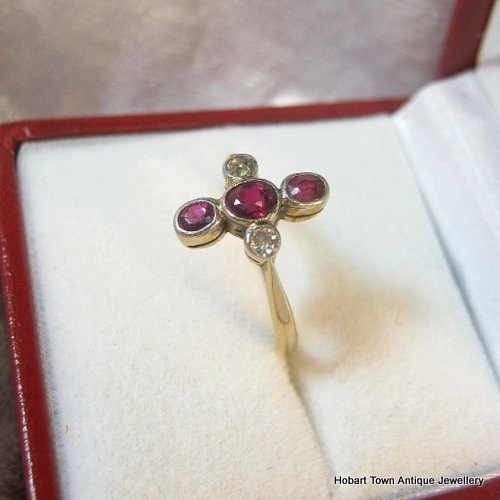 When created to good proportions , by a talented hand ~ using fine gemstones and then come back around 140 years later ……… and you will have a superb Hand Made Victorian Ruby Diamond 18ct Gold Cruciform Antique Ring !! Finger size etc added shortly. 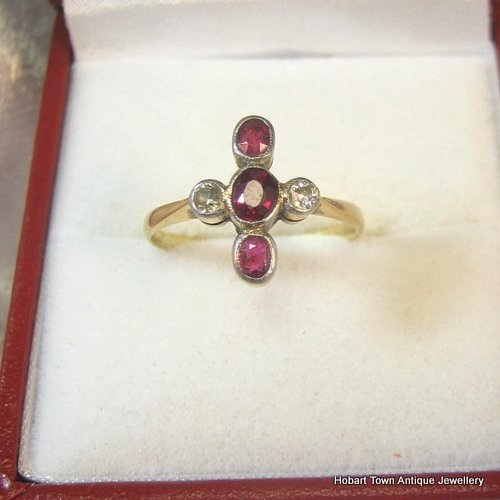 If you would like to ask any questions about this gorgeous Victorian Ruby Diamond 18ct Gold Cruciform Antique Ring , please email for a prompt reply.